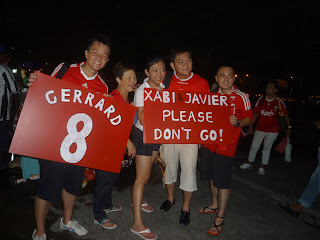 And so, after all the persuasions that we have made to Xabi, he has still decided to go. 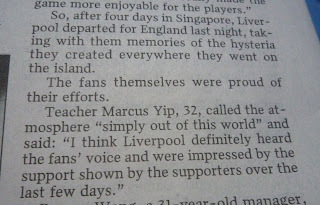 I guess when he was in Singapore, I kind of have a bad feeling that he has made up his mind. 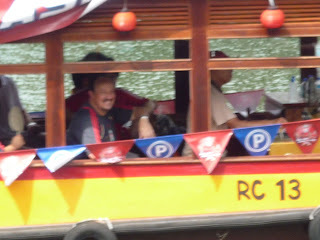 When he was on the River cruise, he didn't really wave back at us and was looking glum. After the match, he did waved at the fans but it was really a wave that says, "sorry guys, I know I am going to let all of you down." I have been thinking of reasons why he wants to leave. Below are just my guesses. He is Spanish, and any Spanish would love to win a champion medal in his own backyard. He is now 27. He may never get the chance to win a champion's medal back home and since Real has come to make an offer, it represents the best chance for him. Furthermore, with Kaka, Ronaldo, Benzema, and a whole lot of good players at Real, it has simply improved their chance at clinching the La Liga. But on the other hand, I do feel that he has grown fed up at Liverpool's title challenge. Yes, we may have been only 4 points behind Manure last season, but year after year, we have stumbled at the crucial stages. I really feel that next season could be our season because the players have been playing together for 2 seasons and their understandings have improved by lots. With Xabi's accurate long range passings, Mash crunching tackles, we could be a force next season, provided Gerrard and Torres remind injury free. Last season when Rafa Benitez was eyeing Barry, I feel that was the time when Xabi felt that Rafa didn't have enough faith in him. That trust must have probably been broken then even though Xabi did had a good season. 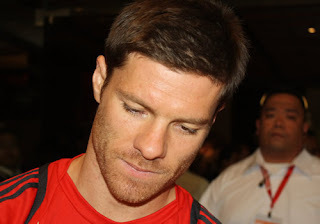 So now that Xabi has had a good offer from Real, he has to take the opportunity with both hands. We always say that is the fans that the players are playing for, but if a coach do not have full trust in you, it doesn't motivate you to play well anymore. 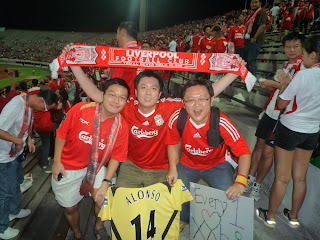 So there you go, my 3 reasons on why Xabi Alonso has decided to put in a transfer request. I am still holding on to the hope he still stay, but this hope seems to be diminishing as fast as my prayers can be heard. 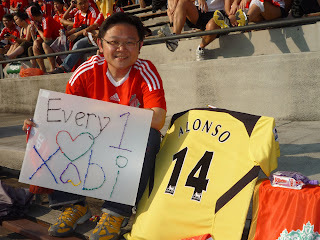 Below are a compilation of how Xabi means to us fans in Singapore. 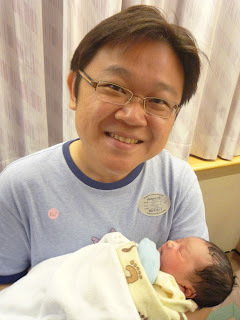 Yes, my friend Chuije has finally given birth to a healthy boy, Braydon! He came into our world on Tuesday, 28 July at 919am! He doesn't have a Chinese name yet, because my friend's mother suggested to let the "Name" master help the baby find a good name. 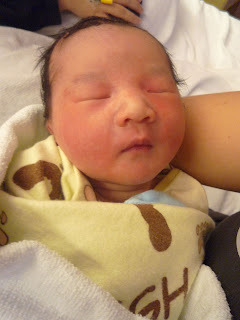 So we have been calling the baby "Xiao Chen" when he was inside my friend's tummy. This is already my second time posing with a new born this month. Will the baby touch passed onto me and make me a daddy soon? Haha...watch this space! Remember I was telling you something about ear wax? Now my ear got a problem, it's blocked and i can't hear well. I went to see a doctor yesterday and it was diagnosed as a inflammation of my right ear. Oh man, i have been hearing myself and the voice is so hollow whenever I speak. If this persist, I have to see the doctor again. 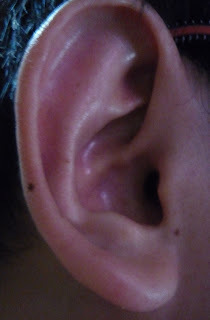 You know, my left ear has always has a humming noise ever since God know when and now my right is having this problem. Maybe i am going to be deaf soon... pray for me ok? Florentino Pérez, the Real Madrid president, has claimed that Liverpool are out of touch with reality in asking £30m for Xabi Alonso. Madrid are keen to buy Alonso and the midfielder has indicated he would welcome the move but, in the latest episode in the long-running battle between the clubs over the Spain international, Pérez has criticised Liverpool's stance. "Some people obviously thought that, because we said we wanted more Spanish players, they could ask for fees which don't correspond to reality," he said. "A year ago certain players we've asked about would have cost less than half the price we're being quoted now. If necessary, we'll find the Spanish players we would like for the squad in our youth side." Pérez happily spent £80m on Cristiano Ronaldo and £56m on Kaka this summer but has been more resistant to paying large amounts for Spanish players. He concluded that Valencia were asking too much for David Villa and would like Liverpool to lower their demands on Alonso. 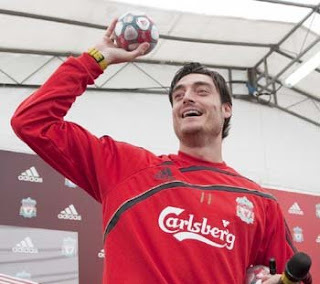 Benítez has suggested that he will not stand in Alonso's way if the player wants to move and Liverpool get a suitable fee. My views : Then please BlOODY F**K Off! Stop all your interest in my Xabi and find your own in the youth team, B**TARD ! Yes! 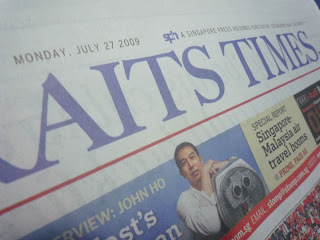 That's today Straits Times which I got early in the morning just before I reached workplace. 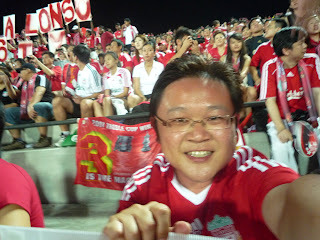 Last night at the Liverpool v Singapore match, I was, surprisingly, interviewed by this SPH journalist, Christopher Ong. He asked me 3 questions and told me he will give me a call if my interview will be printed in the papers. But he didn't call. So I got the papers super early in the morning to check it out! 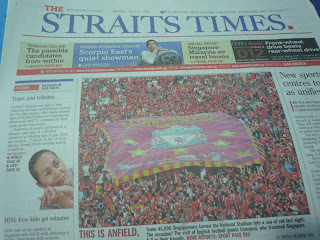 This is the front page of today's Straits Times. 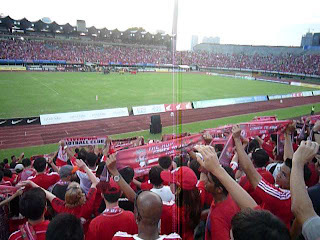 Look at the big banner displayed in the stadium. Too bad my section didn't get to touch and move it! Scroll down more to find my interview! And YES, finally, that's my interview in The Straits Times! This was the reporter who interviewed me! 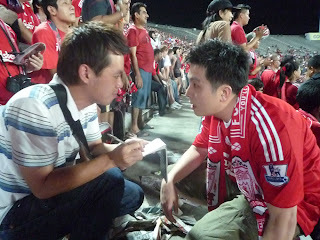 Here he is interviewing my friend, Kok Kin. Too bad, his interview didn't appear in the papers! 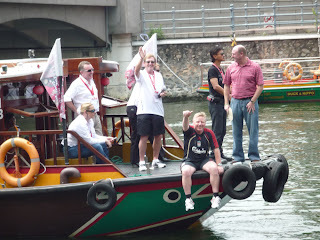 I suspect the reporter got us as we were sitting at the walkway and were very noisy with all our chantings and singing. I have to put my nice flags to reserve the seats for all the friends who are only coming after 530pm!!! See that board which I made, d*rn! was running out of the bubble pen and that's why you see multi colours! I was there at 4pm! Before I entered the stadium, I actually sold 2 tickets. Let me describe what happened... my sis and her bf couldn't make it for the match as her bf has to work. So I got a bigh cardboard and of course, their 2 tickets, and set up a stall besides the keropok seller. I lay my "Champion of Europe" flag on the floor, then let the cardboard stand as a "A". 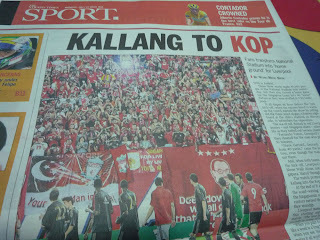 On the board I wrote-"2 Kop end tickets for Sale". I read my NewPaper while I wait for business. Within 3minutes, I got my first customer, he wanted 1 and asked for the other to be reserved as he waits for his friend's replay. I sold it for $75. For the next 5minutes, fans passed by and stare at my board. Really feel like I am doing a flea market sale sia... The fellow who bought my ticket came back and told me he do not need the other ticket anymore. I thought, oh no... "Will I be able to part with the 2nd ticket???" Out of the blue, this foreigner (looks like from China) approached me and wanted me to sell it for $60, I said "No, $75" . He asked for a small discount, I told him $70 last price and ...DEAL! Yes, I sold both tickets, but at a loss lah, but better than not selling them away right?! These 2 fans were dancing along to The Beatles "I Want to Hold Your Hand". I was singing and if I was besides them I will join them in the dance for sure! 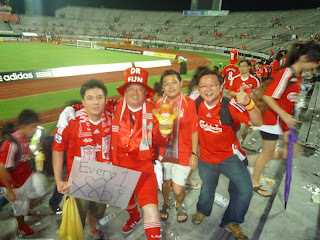 Among the crowd were fans from overseas! 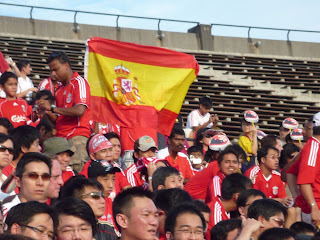 I saw Brunei and Indonesia flags too! 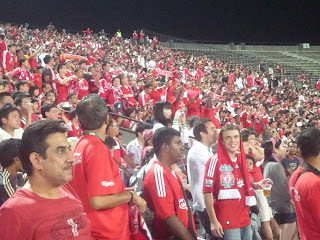 I also heard Hong Kong fans in the crowd. 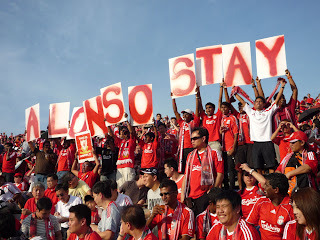 And yes, that's the goal of all Reds fans for the past 4 days. Alonso STAY! 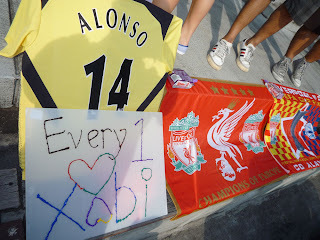 Cos' Every1 LOVES XABI! 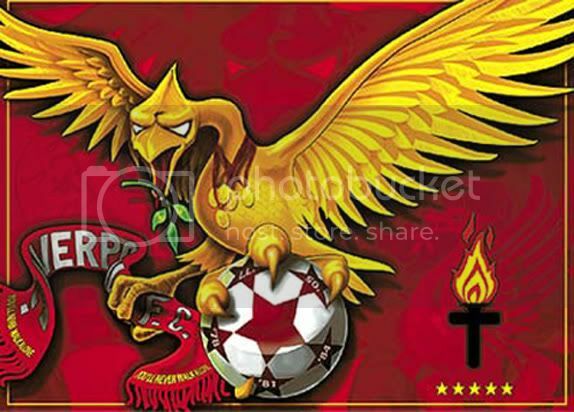 The match finally gets ready to kick off but not before we sing the anthem "You'll Never Walk Alone"!!! When we were singing it for the last time last night, I nearly cried... not because of the song, but the thought that if my friend Ziming was still alive and there with me. RIP my friend. 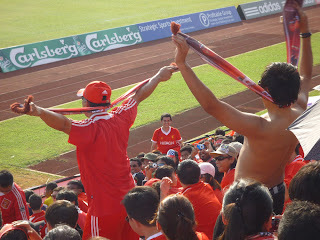 Throughout the match, the ang moh you see on the right, kept initiating the Kallang Wave. Me and Kok Kin got him a Carlsberg for his effort lah. Super passionate and fun! Oooooooh what a day! 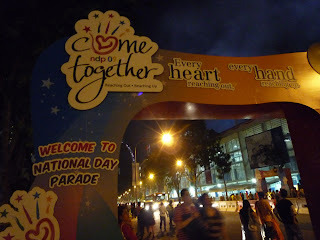 I am so dead tired but here I am, 130am Singapore time, eager to share with you what I did today. First of all, I did 2 things which pleases my heart today. This morning when I was at JP, there was this old man (should be in his 60s) who was trying to show me the pass that he was wearing round his neck. I only saw that he suffered a stroke and that was about it. I wasn't sure what he wanted but when he went to another table, the group of Malay ladies at the table actually gave that man a part of the sandwich which they were having. After that only did I realised he was asking for food. I felt bad for him and went to get a cup of hot Milo for him. He was so grateful and kept turning his back and thanking me. I felt so pleased to have made him so happy. At that time, thoughts of this old man might be out to get a free lunch tried to distract me but then I also remembered what the church has taught me- "When I was hungry, you fed me..." The more I think of that bible verse, the more I felt I had done the right thing. The 2nd thing happened towards the end of the day. I will tell you as you continue to scroll down! 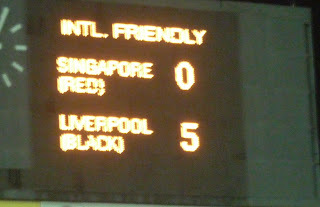 Today was Liverpool FC 3rd day in Singapore and I finally get to see my heroes face to face! 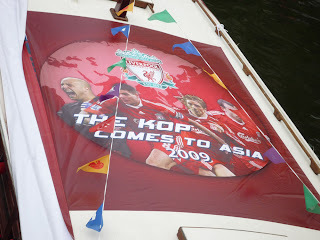 After breakfast at Jurong Point, I decorated my car with Liverpool's scarfs, my Torres' pennant, then set off for Singapore River, where Liverpool FC will be taking the river cruise. I reached there alone at 1pm and met 2 new friends, Regina and Frank. They were also converted Catholics (such joy!) like me and look like in their mid-40s. 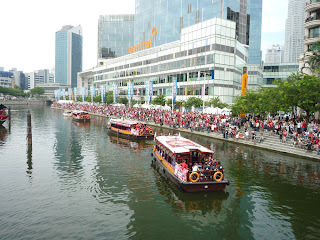 When 3 boats carrying the whole team arrived, Riverside Point and Clarke Quay simply went bersek. 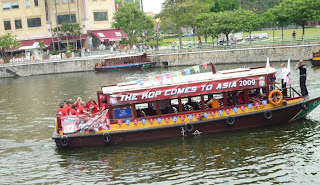 Fans were running along the riverbanks, chasing, singing, shouting and snapping their cameras. And that includes ME! Let me take you through my day with pictures that I took during my "Chase Idol" day! I called out to Degen, "C'mon Degen, make the right back position yours!" He acknowledged that with a wave back too! 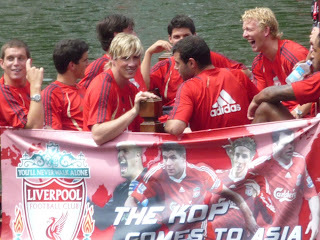 These are shots of the first boat and probably the most popular one, cos' TORRES is there! 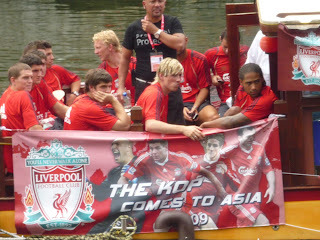 The 2nd boat-Reina, Carragher, Degen and the youngsters. 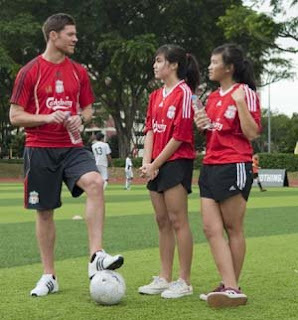 There were frequent shouts of "Don't go Xabi!" and of course I aslo kept shouting that too! He can't go! 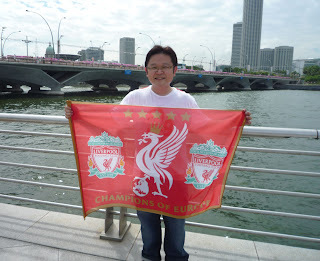 He's my favourite Liverpool player! 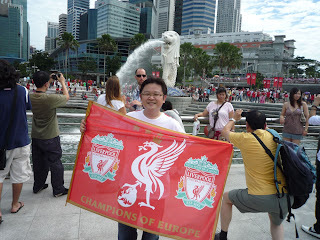 And yes, finally I reached the Merlion, where the Liverpool's river cruise ended. 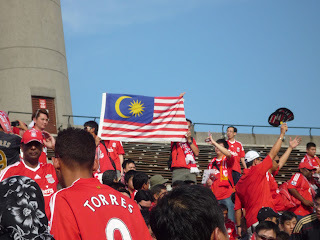 See the flag I am holding...you know what, people started coming to me, wanting to borrow my flag to take photos with! I jokingly told them $2 for the rental and the shots! 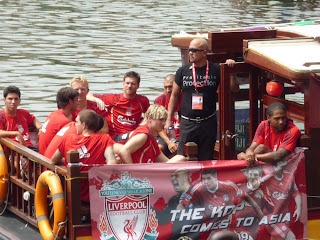 After the cruise ended, I walked to Mandarin Oriental, hoping to see the players enter the hotel but too bad, I didn't get to see them and decided to walk back to Clarke Quay to get my car. Along the way, I bought these things! Look at the black marker which I got too! 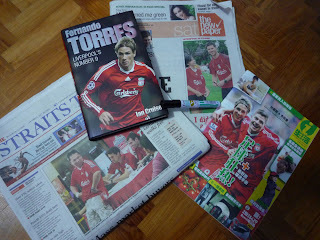 Just in case I get to see Torres and I can ask him for an autograph on the Torres biography which I got from MPH! 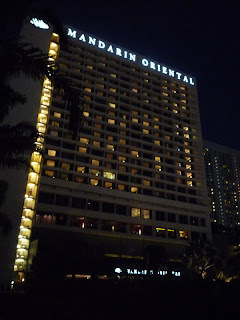 After getting the car back, I went back to Mandarin Oriental! But I couldn't get a lot at the hotel so I parked at Ritz Carlton. I met more fans outside the hotel and this fan actually got Reina and Agger to sign on tomorrow's match tickets! D*rn! Why do i have to work on Friday!!!??? I also met some really young fans and I realised how old I am! Kids being kids, they talked loudly and talked nonsense! 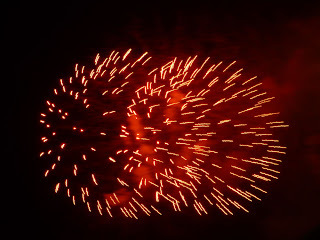 While waiting outside the hotel, the NDP preview show was going on and I managed to enjoy the show through the sound coming out of the show and also the fireworks! While I was sitting outside the hotel, this young Malay family of 3 was sitting beside me. 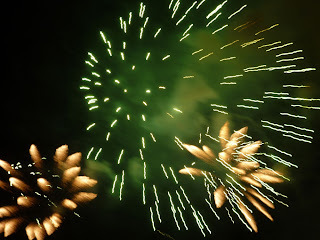 After about 15mins, they decided to move somewhere on my right to have a better view of the fireworks. To my surprise, I found a lady's handbag on my left. I immediately picked the handbag up and went to my right where the young family has shifted to and return the handbag to the mother. She was so relieved to see her handbag and she still haven't realised she has forgotten her handbag! Even though it was a small gesture from me, I felt really good that her handbag was left besides me and not somewhere else. I would surely not take someone precious possession as I truly understand the feeling of losing my own things. Well, it was 830pm and still no sign of the team coming out of the hotel and my chances of having the Torres biography flew pass....And that's my Sat for you! 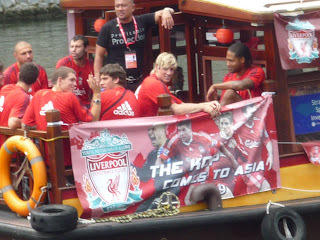 Liverpool is in town and well, I should be chasing them and attending their meet-the-fans sessions. But d**n, I am working and the events are all held on weekdays! 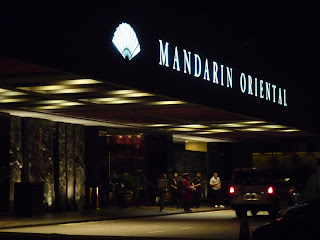 Tonight I finally get a piece of the action when I went down to Mandarin Oriental, hoping to catch a glimpse of my idols. 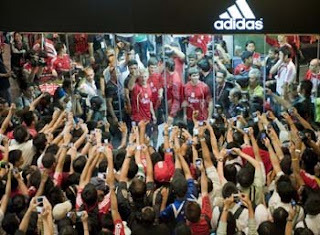 In the end, I saw Liverpool.....fans : ( Around 20 fans were hanging around the entrance of the hotel and that's about it. I heard they just came back from training and are having their dinner on the 4th floor of the hotel. How i wish i am inside the hotel, but then again, if i was to see them face to face, i seriously don't know how i will react, maybe i will be too starstruck to even asked them for autographs! 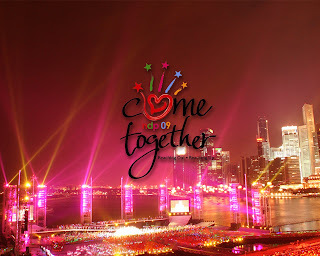 Anyway, I got a few pics from the official website to share with you all. Wow! My favourite brand and favourite club! Wish I was there! My idol! 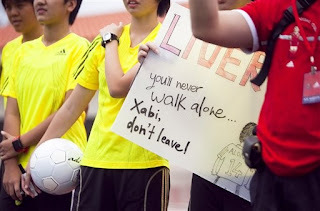 Xabi please don't go! 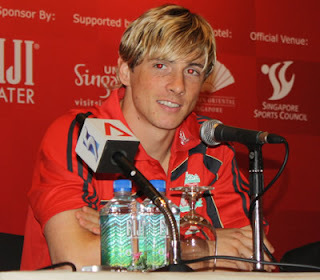 El Nino, female fans' favourite guy out there!